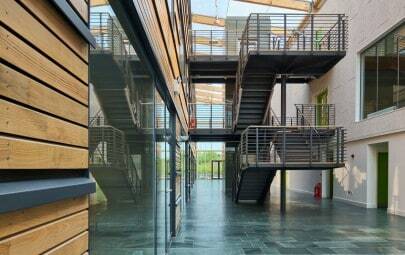 Once home to a different Architen Landrell membrane roof, the Aurora House offices were undergoing redevelopment and modernisation under a brand new owner. 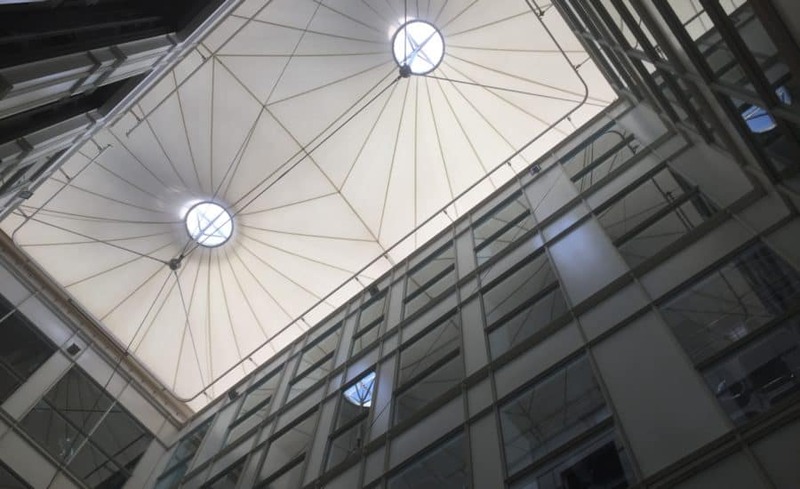 The existing double conic canopy, made from PVC coated polyester, had covered the courtyard for more than 15 years and still looked great and performed well. 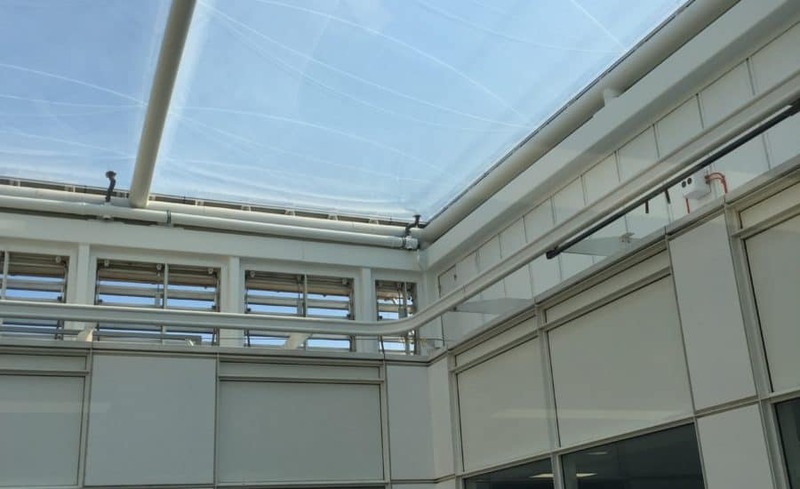 However, the building owner was keen to allow more light into the space and so turned to us to discuss the possibility of replacing the original tensile fabric roof with an ETFE cushion roof. Thrilled to be able to return to one of our original fabric installations, the Architen Landrell team set about designing a system to work seamlessly with the existing structure and ensuring that the loads imposed on the old building were not too great. The new roof is made up of 5no. 3.3m x 10.7m ETFE cushions, totalling an area of 176sqm. 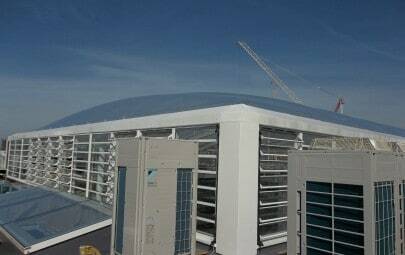 The three layer ETFE cushion roof gives a good level of insulation whilst still ensuring a high amount of light transmission. So much in fact, that a silver fritting was added to the top layer of ETFE foil to ensure that the space below wouldn’t overheat. Returning to the site almost 20 years after the original installation, Architen Landrell removed the existing tensile fabric roof and it’s supporting steelwork; stripping it back to the primary structure. Thanks to modern technologies, both the steelwork and the fabric membrane could be recycled to ensure that minimal waste was sent to landfill. Now faced with an open atrium, our installation crew set about installing the steel structure to support the new ETFE cushion roof. Made up of a perimeter ring beam and 4 arched members, the steelwork appears light and unobtrusive, far more so than would have been possible with glass. 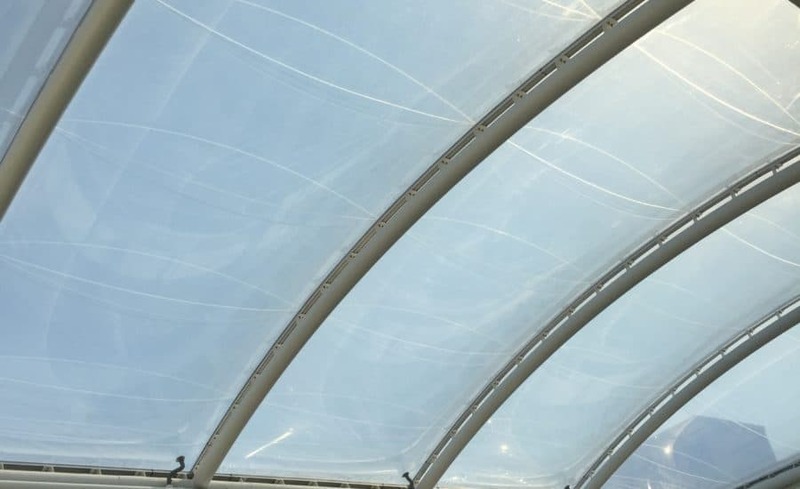 The ETFE foil cushions themselves were installed using work positioning nets and form both the weather-proofing and insulation layers. Although fritted to control light and heat gain, the ETFE membrane appears clear and the atrium looks open to the sky. 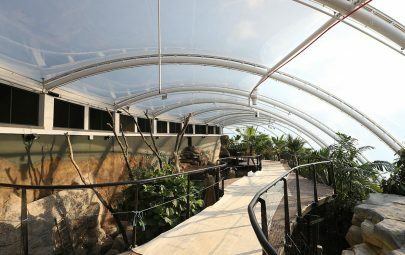 The addition of the ETFE cushion roof has allowed the space to be updated without major modifications required to the building. 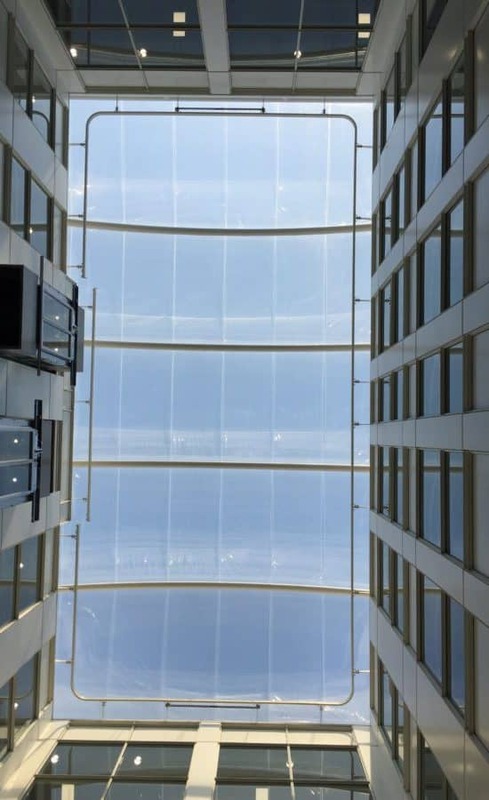 Following in the footsteps of the original conic fabric canopy, Aurora House’s new membrane roof will continue to provide an architecturally beautiful and comfortable space for its occupants.